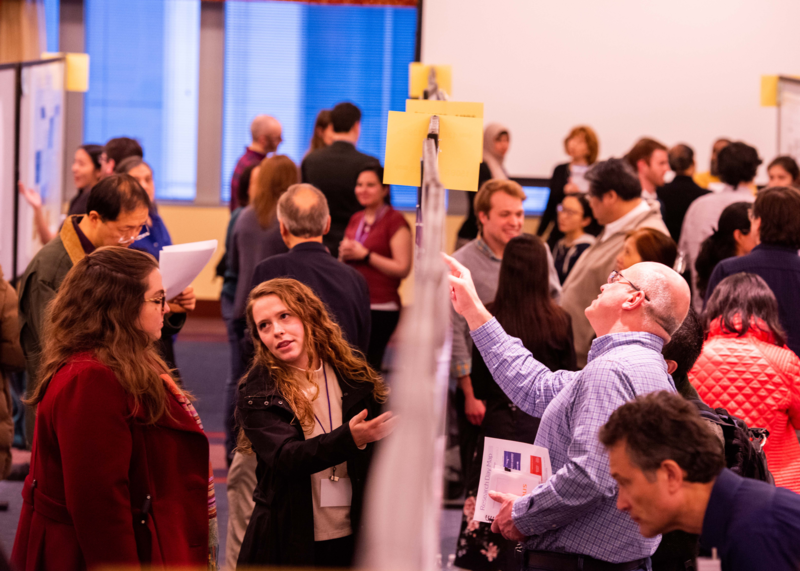 Over 450 students, staff, trainees and faculty presented abstracts at the 15th Annual Lewis Landsberg Research Day. Photo by Nathan Mandell. 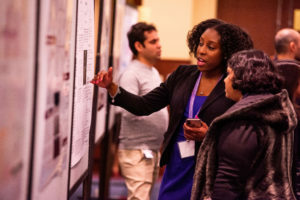 On Thursday, more than 450 scientists, trainees, students and faculty presented posters and abstracts at Feinberg’s 15th Annual Lewis Landsberg Research Day, with record-setting participation and attendance. One scientist, Vishal Kothari, PhD, research assistant professor of Urology, analyzed gene transcriptomes from nearly 20,000 prostate cancer patients, identifying a new class of prostate cancer characterized by unusually low androgen activity. Barbara Meyer, PhD, investigator of the Howard Hughes Medical Institute and a professor of Genetics, Genomics, and Development in the Department of Molecular and Cell Biology at the University of California, Berkeley, delivered a keynote address on modeling X chromosomes. The synthesis between laboratory and clinic was on full display — something touched on by Rex Chisholm, PhD, vice dean for Scientific Affairs and Graduate Education, as he welcomed attendees to the event and presented the Medical Faculty Council Mentors of the Year and Tripartite Legacy Faculty Prize awards. 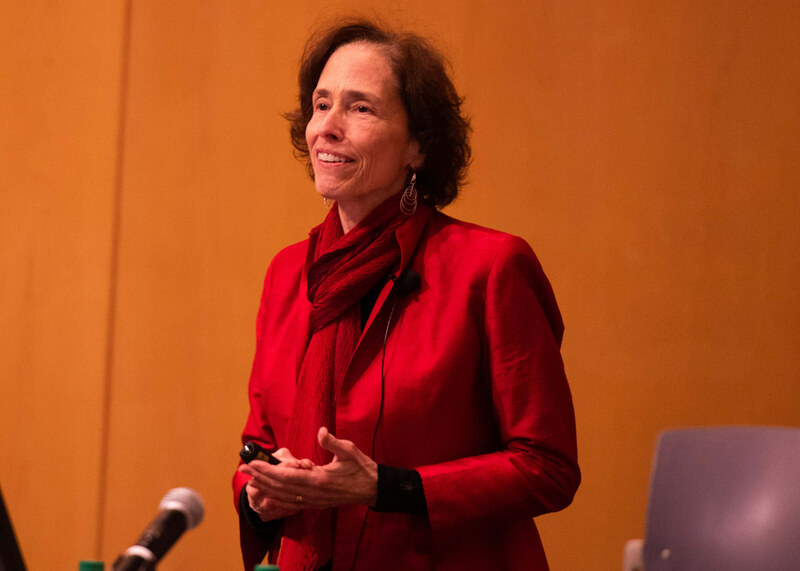 After an introduction from Chisholm, Barbara Meyer, PhD, investigator of the Howard Hughes Medical Institute, delivered a keynote address on modeling X chromosomes. After the keynote, attendees spread out across several exhibition spaces throughout the Robert H. Lurie Medical Research Center and Northwestern Memorial Hospital, perusing hundreds of scientific posters and chatting with investigators like Vania Vidimar, PhD, a postdoctoral fellow. The event gave investigators the chance to network and exchange ideas about their projects. Photo by Nathan Mandell. Vidimar discovered a toxin that physically cleaves the RAS protein — a protein implicated in as many as 30 percent of cancers — and showed delivering this toxin to cancer cells could curb tumor growth. Of course, not all scientific investigation occurs in basic science laboratories. Jordan Sell, a second-year medical student, repurposed a decidedly low-tech instrument to improve IV placements in the clinic. Other investigators looked at problems with broad impact, such as Sadiya Khan, ‘09 MD, ’14 MSc, ’10 ’12 ’16 ’17 GME, assistant professor of Medicine in the Division of Cardiology and of Preventive Medicine. 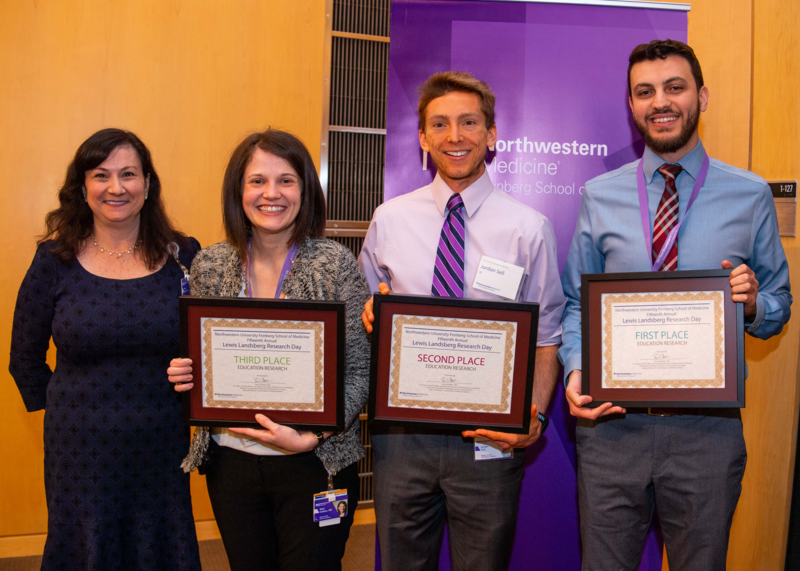 Diane B. Wayne, ’91 MD, vice dean for Education and the Dr. John Sherman Appleman Professor of Medical Education, with award winners in the Education Research category (left to right): third-place winner Blair Golden, MD, instructor of Medicine in the Division of General Internal Medicine and Geriatrics; second-place winner Jordan Sell, a second-year medical student; and first-place winner Rhami Khorfan, MD, a second-year fellow in the Surgical Outcomes and Quality Improvement Center (SOQIC). Photo by Nathan Mandell. While cardiovascular death rates in the United States have decreased since the 1970s, that trend has reversed and is now creeping back upward, according to Khan. She and her colleagues examined population health data to diagnose the current state of affairs and predict what the current trajectory would produce in 10 or 30 years. “Even though the overall trends are getting worse, we’ve made good progress and a greater proportion of the population is in the ideal category for cholesterol, blood pressure and smoking — a reflection of our public health efforts around those measures,” Khan said. Instead, the primary driver of the current slump is diet, Khan explained, and targeting diet, physical activity and glucose intake should be priorities for public health programs. ARCC Community-Engaged Research Partnership Award: Building Capacity for a Community-Based Research Partnership to Optimize Physical Activity in Lung Cancer Survivors (Be-Lung). Be-Lung is an intervention to increase physical activity among lung cancer survivors in Chicago. It is a partnership between Shirley Ryan AbilityLab, the Robert H. Lurie Comprehensive Cancer Center of Northwestern University and Gilda’s Club Chicago, a community organization that supports individuals and their families and friends whose lives have been impacted by cancer. Tripartite Legacy Faculty Prize: Kathleen Green, PhD, the Joseph L. Mayberry, Sr., Professor of Pathology and Toxicology, associate director of Basic Science Research at the Robert H. Lurie Comprehensive Cancer Center of Northwestern University and a professor of Dermatology. Medical Faculty Council Mentors of the Year: Tamara Isakova, MD, MMSc, associate professor of Medicine in the Division of Nephrology and Hypertension and director of the Center for Translational Metabolism and Health within the Institute for Public Health and Medicine (IPHAM), and John Varga, MD, director of the Northwestern Scleroderma Program and the John and Nancy Hughes Distinguished Professor of Medicine in the Division of Rheumatology.